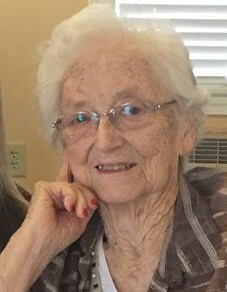 Jean Schmitt, 91, a longtime resident of Montgomery, NY, passed away peacefully, with loving family by her side, on Sunday, July 1, 2018, in Raleigh, NC. She was born on May 2, 1927 in White Lake, NY, the daughter of the late Jay and Mary Elizabeth Meddaugh. She was a registered nurse graduating from St. Luke’s School of Nursing and received her Teaching Certification from Empire State College. She was a School Nurse and Health Teacher at Valley Central High School for many years. She was a long time member of St. Mary’s Church in Montgomery. She was predeceased by her husband of 59 years, Charles “Bill” Schmitt, who passed away in 2008. Survivors include her daughter Stephanie Kuhlow and her husband Robert of Garner, NC; son Jeffrey Schmitt and his wife Victoria of Esperance, NY; daughter Colleen Saracino and her husband Dino of Mineral, VA; and daughter Sue Ellen Crumblish and her husband Mark of Dallas, TX; nine grandchildren, Sasha Kuhlow, Lani Kuhlow, Janel McGowan and her husband Matt, Ryan Schmitt, Jeffrey Schmitt, Noelle Miller and her husband Lance, Eamonn Crumblish and his wife Chandler, Connor Crumblish, and Chandler Crumblish; and three great-grandchildren Gemma and Landon Miller and Bryce McGowan. A private Graveside service will be held at the Brick Church Cemetery in Montgomery, NY.